Liz holding some ore we found in the woods surrounding Bridgeville, NS. View through the F-150 window. Liz and I spent the past week visiting more locations throughout Pictou County, ranging from operational industries to forgotten furniture factories from the 1700's. Perhaps one of the most spectacular sights was our return to the Pioneer Coal mine in Stellarton, having been granted access through the head office. The site manager was a friendly and welcoming fellow with a wealth of knowledge about the mine. 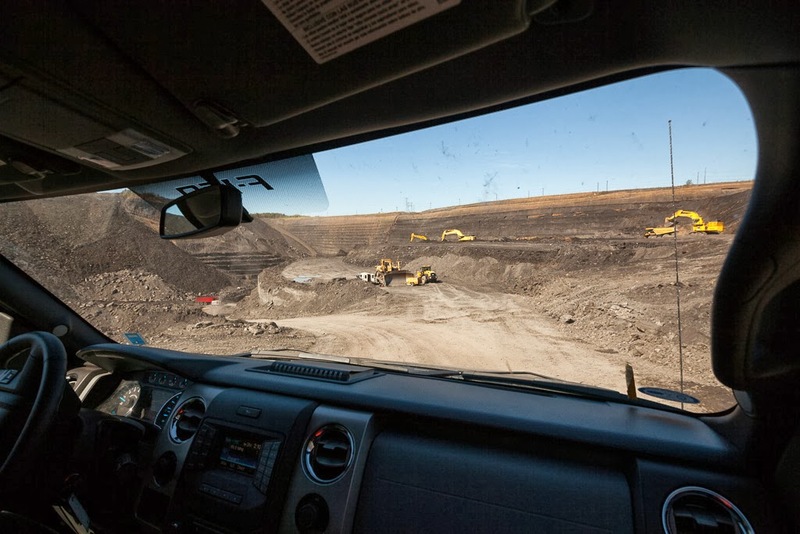 After outfitting us with hard hats and reflective vests, we hopped into his Ford F-150 and descended into the pit. 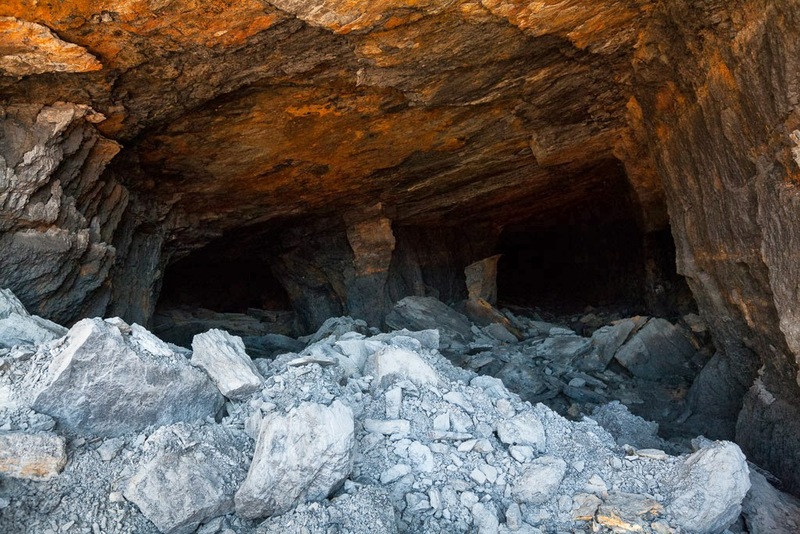 Considering that only about 45 people are currently employed, the mine was bustling with activity with large dump trucks, diggers, and "rock-saws" weaving there way through the black-earth roads. Exposed shafts from the Foord seam. Our first stop was an old shaft from the historic Foord seam, exposed through present day mining activity. Peering down into the eery darkness, we couldn't really imagine people manually carving away the shaft years ago. Part of the job of the present operation is to fill in and secure old shafts like this so they are stable for the future. We found the layers of sedimentary rock that entombed the coal quite beautiful and an important part of the history. As we finished the day, we were impressed that our chariot—the F-150—managed to get over the rugged terrain and were both pleased to have left our hard hats on in the truck as well. 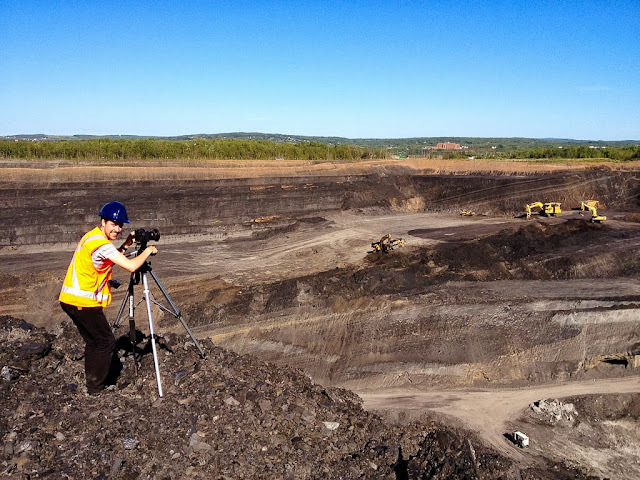 Photographing inside the open pit coal mine in Stellarton, the last active coal mine in Nova Scotia. 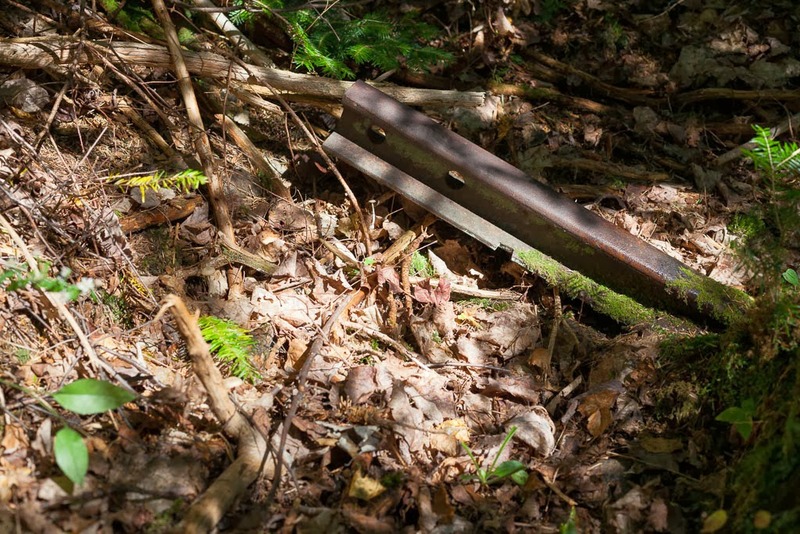 Old rail found near Bridgeville, NS. Though our project is in its early stages, we've already met a number of locals willing to help us out. In Bridgeville, we were directed to a local graphic designer and historian who has a wealth of knowledge about early industrial exploits in Pictou County. On Thursday, he toured us through the woods near Bridgeville pointing out old iron ore pits and forgotten rail tracks. 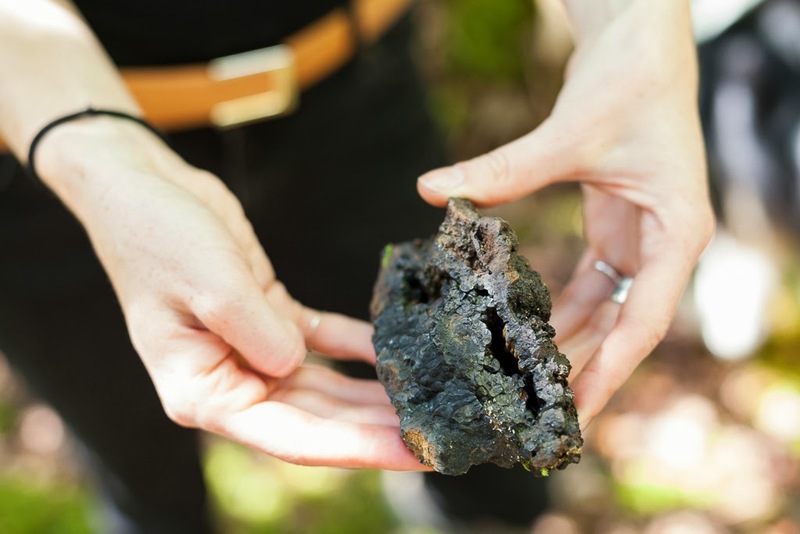 We explored an old slag heap near the former town of Ferrona, purposely established for iron production—the name came from ferrum, latin for iron. As the sun began to set, we visited the tranquil site of a stone furniture factory, constructed over 220 years ago. Pre-dating coal (and the industrial revolution) this factory and the nearby grist mill used water power from the nearby river. 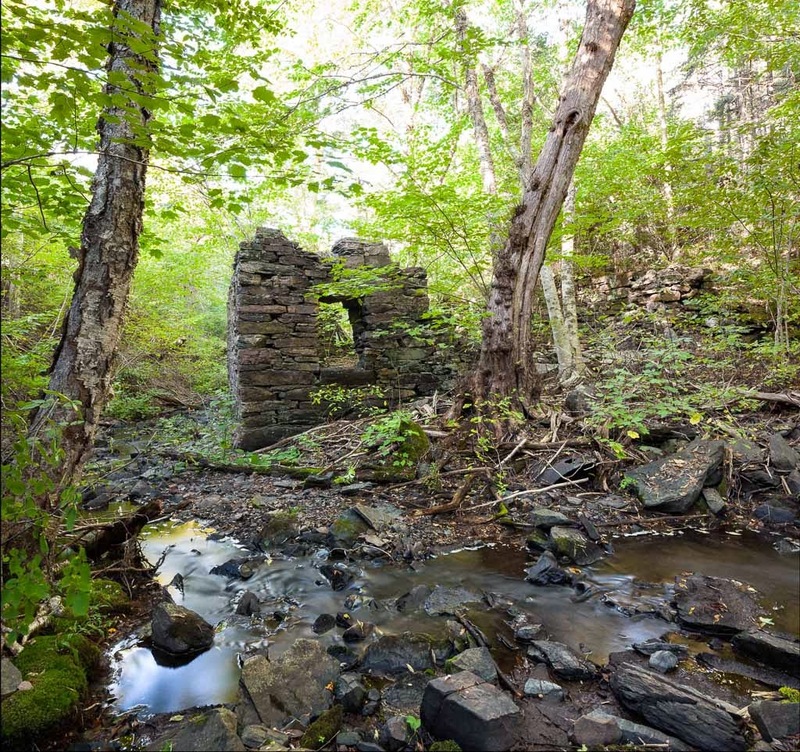 This location is a fine example of the undiscovered history that surrounds us in Nova Scotia. The remains of the furniture factory near Millstream, NS.